This week, I taught Shaun Tan’s The Arrival to my undergraduate students. I’m currently working on an article with a few colleagues in which we’re analyzing ways to teach social justice by incorporating graphic novels into our classrooms. My colleagues have taught The Arrival in K-12 classrooms and I’ve had the unique experience of teaching the graphic novel to college undergraduates, many of whom plan to be educators. For my first “pay it forward” post, I wanted to provide practical applications for graphic novels for those of you who are teachers. I’m fascinated by the wordless nature of the novel. I think there’s something magical about the art in this book—it transcends age and experience. We’ve had third-graders write letters to strangers, fifth-graders make up meanings to the “language” in the pages, and high schools analyze how Tan portrays the immigration experience. My college students talked about the “displacement” of the reader and how that mirrored the experience of the protagonist of the story. We discussed teaching methods and book pairings and ways to promote social justice in our classrooms. Graphic novels are difficult to teach. Some teachers will have to jump through hoops just to include them in their classroom—critics argue that the novels are superhero comics and have no merit. A quick Google search will give you thousands of lesson plans and arguments in favor of multimodal literature. Even Dave Pilkey provides lesson ideas for his Captain Underpants series! Children latch onto the images in The Arrival. They understand feeling unwanted or scared of a new place. They draw pictures or write letters or make up their own language and signs in imaginary cities, responding and interacting with Tan’s work. When I work with adults, I have my students read the book in pairs or groups—they work together to construct meaning and engage with the text. I watch these groups create a communal story and share emotions (laughing, arguing, sharing) and I see my class become a stronger community. My immigrant students share their personal stories and my students teach each other. 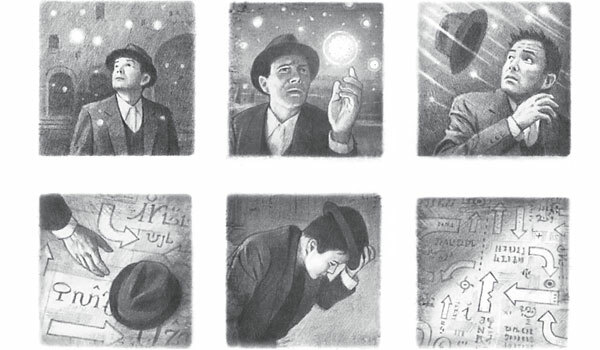 In my children’s literature course, I pair The Arrival with The Invention of Hugo Cabret by Brian Selznick. Hugo lets my students enter into the world of graphic novels. The chapters of prose are comforting for my students who have no experience reading graphic novels. Other students, who confess to hating Maus or Skim, find The Invention of Hugo Cabret to be a more palatable entrance to the genre. I give them Hugo to get them on board, then I throw them The Arrival to get them engaging with the text. I make sure to tell them not to read The Arrival before they get to class—reading it together is part of the process! Some of my students don’t enjoy the process of reading The Arrival, but others find meaning in the images and connect with the emotions Tan folds into his drawings. Do you incorporate graphic novels in your classroom? Are you a fan of The Arrival? Mary Catherine Miller is working on her doctorate in children’s and young adult literature. She posts book reviews and musings over at travelswithmary.com. I’m a huge fan of both books which I’ve used in my fourth grade classroom. I’ve been using The Arrival as part of our study of our year-long study of immigration since it first came out in 2007. That first year we made an Arrival box, filled with artifacts from the book which we presented to Shaun when he visited us. I did a series of posts about my work with the book here: https://medinger.wordpress.com/tag/the-arrival/ Shaun used archival images from Ellis Island as source material so I always have my students look for that when we visit. There are tons more ways to use the book — it is fantastic for a study of immigration. One more thing, I highly recommend having kids not just read graphic novels, but make their own. I’ve been doing an immigration oral history comic with my students for years. The do oral history interviews of immigrants, transcribe them, do the art, and turn them into comics (using Comic Life). I love the idea of having students create graphic novels– I use Comic Life in my classroom and it’s an option for the final project (in lieu of an exam) at the end of the semester. I know my colleagues allow their students to sketch and write responses, though I’m not sure how many of their students have made their own graphic novels! I wish I could be in NYC to see you present with Brian Selznick, I’m sure it will be wonderful! Thank you so much for providing so many of your experiences, I love hearing about practical applications for graphic novels! I use Peter Sis “The Wall” after I teach “Animal Farm”. It drives home the points I have been making. I have students read the novel in pairs as well. They discuss everything and discover many things that they didn’t know about Communism. oh, what a great pairing! I love the idea of pairing students to read together– it worked so well for me with The Arrival that I’m thinking of using it with other texts, too. I haven’t read this one yet but I do enjoy ‘The Lost Thing’ tremendously. What an artist! 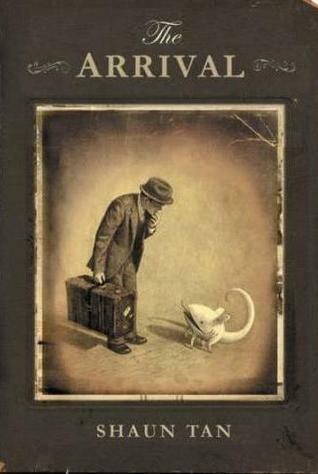 “The Lost Thing” is just stunning– I agree, Shaun Tan is so talented! Reblogged this on Principal Literacy (and Other News). This year I came across the book Darkroom: A Memoir in Black and White–it’s a beautiful graphic novel. It could definitely be integrated into a unit on social justice. It’s a much different book than the ones I’d typically use to teach that topic. Briefly, it’s the true story of a Latina immigrant’s experience living in Alabama during the Civil Rights Movement. I don’t want to go on and on about it, but if you’re interested in knowing more, I discussed it on our wordpress blog, Vamos a Leer. I think it could have an incredible impact on the classroom not only because it discusses social justice in terms of the Civil Rights Movement, but it also brings in ideas about language, what it means to be ‘othered’, etc. Great post! I’m going to have to check out The Arrival now! Katrina, hey! I haven’t heard about this one but the story sounds incredible, thank you so much for recommending it to me! Thank you for a wonderful and engaging article about one of my favorite graphic novels ever. What I love most about this book is the way readers shape the story in their heads and bring in their own background and experiences in a way that makes this story universal and personal. It opens doors to conversations, as you said, in a way that no other medium can. I have used graphic novels (Maus, Stitches, and Smile) in my oral interpretation of literature class this semester to talk about personal narrative and the internal drive to tell your story – and how important it is to let your voice be heard. Such powerful lessons are at the core of graphic novels. thank you so much for your wonderful compliments– I completely agree with you, the magic in this book is how readers can write their own story and bring their own experiences to the table making such a unique transaction. I love it! I’m reading this post a bit after the fact but I had a question. I teach 4th grade and will be incorporating genre studies in our reader’s workshop. Graphic novels are often included as a separate genre on lists, although I see how they really are a different format. How do you suggest to approach this with 4th graders? Rebecca– I’m sorry for the slow reply, I just saw your post! I think you’ve hit the answer when you mention “format.” My undergraduates have similar trouble deciphering “genre” (which is a post all its own!) For graphic novels, I introduce them as a medium– we have text-based novels, film, graphic novels, etc. Within graphic novels there are tons of genres as we traditionally think of them (fantasy, historical fiction, etc.) Does this help at all?